For over 17 years, HPC and Enterprise environments have leveraged DDN’s deep domain expertise in compute, application and systems to address their unique storage challenges and data management requirements. 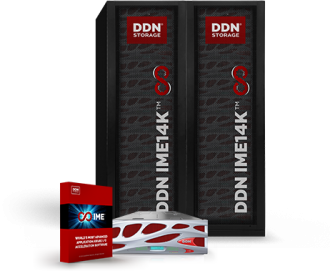 DDN delivers a comprehensive and seamless portfolio of enabling end-to-end storage technologies that provide an extremely flexible data lifecycle management set of tools that can be applied anywhere and at any scale. These pillars of technology can be connected together to solve end-to-end data lifecycle management challenges, enabling you to achieve peak efficiency and extract maximum value throughout the entire lifecycle of your data. To learn how DDN and XENON can deliver a customised solution that will significantly speed up your analytics and workflows, simplify your environment, and increase your ROI, contact XENON to speak with our technical experts for a detailed assessment and we will help you build and deploy the optimal infrastructure for your specific needs. IME delivers up to 1000X application and file system speed-up with the world’s most advanced application-aware I/O acceleration software, removing randomness out of workflows and reducing uncertainty and erratic performance in the cluster. This break-through storage application eliminates POSIX contentions, enabling you to convert problem I/O-bound applications into easily resolvable compute-bound challenges. Developed to drive faster time to results for scientific, analytic and big data applications, IME delivers game-changing latency reduction, more bandwidth and unmatched IOPS. For more information, contact XENON. Scaler file storage offers best-in-class analytics, parallel file system and NAS for the most data-intensive and performance-demanding environments. 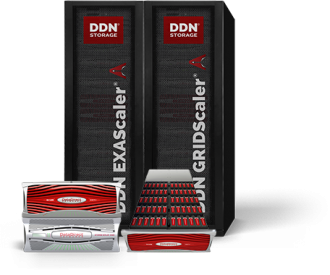 Next-generation EXAScaler® Parallel File Storage System Appliances tightly integrate award-winning DDN HPC storage technology with the open-source Lustre® File System to deliver scalable, clustered storage performance. 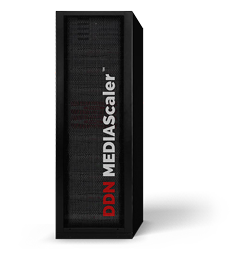 DDN GRIDScaler® provides flexible choices for Enterprise-grade data protection and availability featuring IBM® GPFS™, offering ease of access through traditional NFS or CIFS as well as the option for high performance client access. 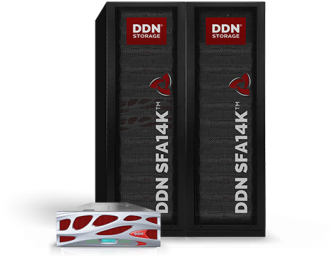 To perform cutting-edge workflows and analytics, our highly versatile DDN SFA14K™ Hybrid and Hyper-Converged Platforms deliver award-winning technology with the necessary breakthrough performance and capacity with NVMe, SSD and intelligent disk tiering with 6 million IOPS to cache and 60GB/s in 4U—scaling to nearly 7PB of capacity in a single rack. SFA14K also provides a highly innovative PCIe fabric plus the option to leverage the power of embedded processors, applications and file systems within the storage array to significantly reduce complexity, latency and data center footprint. Organizations are facing an exponential increase in complexity and cost managing storage at every function of the entire Big Data Lifecycle Today’s storage networks are made up of local block-based arrays, file systems and business analytics repositories, each with their own unique storage management requirements. In order to cope with this explosion in complexity, data managers need the features and efficiency derived from a single application that monitors and manages all types of storage resources. DirectMon is DDN’s configuration and monitoring solution that leverages our leadership in supporting the world’s largest storage management systems. Purpose-built to improve the performance of IT operations, top-down support is provided for managing multiple DDN SFA Storage Arrays and Scaler File Storage Appliances, along with connections to DDN WOS via WOS Access. Taking the complexity out of managing Big Data storage resources, DirectMon’s easy to use features and notifications allow administrators to resolve problems quickly, saving valuable time for more important tasks. DirectMon is ideally suited for any size IT environment to help you simplify the configuration and management of your DDN storage infrastructure, even as you data continues to grow exponentially.